So far in this course we have seen how blogs can be a useful way of 'filtering' the overload of information on the Internet and how you can use feeds to help manage that information. This week we are going to explore another tool that can help you effectively use the Internet for your learning and searches: social bookmarking. Social bookmarking is a way to store and share your favorite websites and blogs online instead of on your computer, which is good for those of us who use different computers. 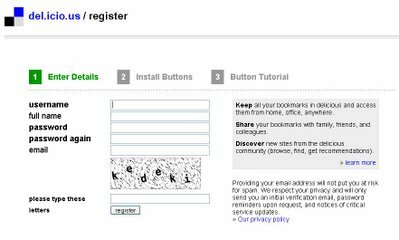 “Bookmarking” because it’s a way to always find your way back to that great website you found. “Social” because not only are you sharing your bookmarks with a community of people, but they are sharing theirs with you; this gives you access to searches other people, with your same interests, have already done to find great websites. We’re going to use social bookmarking to build up a repository of useful websites for all of you in your English language learning, tapping into each other’s resources. Purpose: To start social bookmarking and in doing so, search the Web and del.icio.us for websites of interest to us all (read, read, read), evaluate them and summarize them (write). Task: (If you were in class, presumably you've done all the tasks except maybe finding all 5 bookmarks). 2 - Explore. Go to del.icio.us and explore. Click around to get an idea of what the website is all about. 3 – Log in. You will have to register, as usual, to use del.icio.us (obviously it’s free! ), though I'm confident you're experts by now! Click on “register” and proceed using your bloggingenglish username. 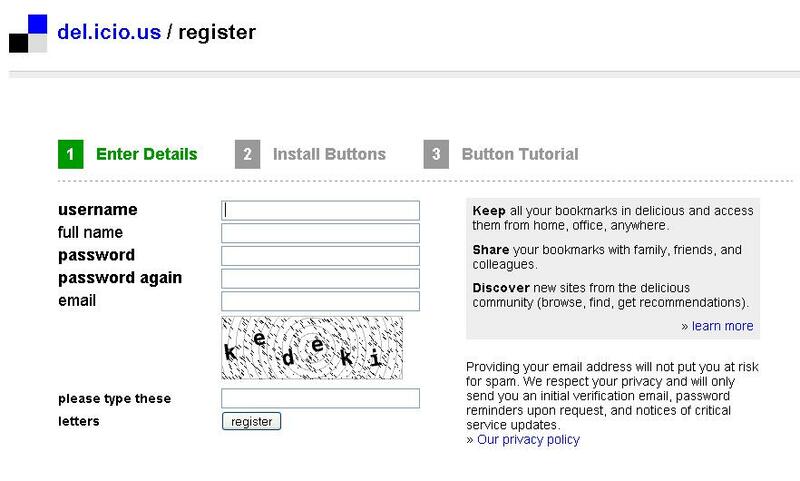 The second step involves installing easy-to-use buttons on your computer; you can do this on your computer at home if you like, but we will not be using them in the language lab. In any case, then go to the top of the page and on the left-hand side you should see "your favorites". Click there and you should see a pop-up window telling you that a verification email has been sent to your email address. Go check your email and click on the link del.icio.us sends you. Once you've done that, you're ready to go! For curiosity's sake, look for the tags bloggingenglish1, bloggingenglish2 and bloggingenglish to see what your peers came up with last semester - some very interesting sites! 5 – Post your new bookmarks (You can watch this tutorial I made last year about posting on del.icio.us). At the top of the page, click on “post”. Then you will see a frame like the one here. description: this is like the title, what other people will see. It can be the title of the website or a summary-title that you make up. notes: Make a 2-5 short sentences summing up the website in such a way as to attract attention. Do NOT cut and paste information from the site; use your own words. tags: These are words that describe the site. Among the other tags you choose, always write bloggingenglish_09. That way we’ll always have a way to find our course bookmarks. 6 - Make a network for the members in your group. First send a comment to your group mails on the course blog (see blogroll) where you sent the comment with the url of your personal blog indicating the username you have on del.icio.us. Then go back on to del.icio.us and click on "your network" on the top left-hand menu and then using the "add" box on the right -hand long menu to add the members of your group (and me if you want) to your network. P.S. I just found these two articles on the NY Times and Repubblica - same story, news a bit different. Check it out. Respond: Choose 1 bookmark from each of your classmate’s 5 bookmarks based on the description in “notes” (find them by using the network you created) and go visit it. Write a post in your personal blog about your impressions of social bookmarking and your classmates’ choices. Timeline: Sunday, March 29 (task), Wednesday, April 1 (respond). N.B. As always, write comments to this post if you've got problems or difficulties. I've posted all about E-tivities and made all the tasks. I'm ready to continue.